The European Collaborative Housing Day showcases inspiring civic initiatives and raises awareness about community-led housing solutions. It also lays out a roadmap for the effective support of community-led processes by public and private actors in both the institutional and financial realms. Links between Collaborative Housing and the social economy, culture, digital technology, and academic research are also strengthened. The European Collaborative Housing Day is a CoHabitat Network initiative and is facilitated by Association urbaMonde in collaboration with city-makers from across Europe. It is the third edition of this kind (following Collaborative Housing Days in Louvain-la-Neuve in 2016 and Berlin in 2017). Visit https://www.ishf2019.com/events/collaborative-housing-day/ for more information (details coming soon). 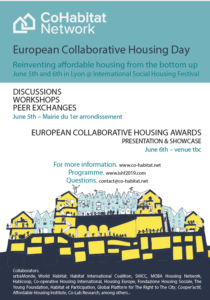 The European Collaborative Housing Day is organized in the City Hall of Lyon’s 1st district, a historical area of cooperatives, social economy and self-organized movements!